Henry II and Thomas Becket – two historical figures well documented through the ages: the former, a prominent Norman-English king who found himself trapped by his political status as both an English monarch and an Angevin count still paying homage to the king of France; the latter, a highly venerated archbishop whose course of life and ecclesiastical history have made him one of the most celebrated heroes of the Christian world. Henry II, blamed by history for causing the death of Thomas Becket; the latter becoming, after his brutal murder, a venerated martyr, a living legend of the Christian world. The lives of these two figures were both entwined and separated by fate, and their actions have had a prolonged effect, not only in their own place and time (twelfth-century England and France), but also for many generations to come. The murder of Thomas Becket in Canterbury Cathedral, often compared with political murders of modern times, have been covered in almost every cultural field of historical interest. Surprisingly, however, less attention has been given to the shattering Henry II and Thomas Becket's affair in the visual arts. The author examines the role played by the Becket affair in the history of one of the strongest and most famous medieval European dynasties – the Plantagenet – who commissioned works of art marked by dynastic aspirations and vigorous attempts at affirming the legitimacy of their sovereign power in order to consolidate their political lineage. The burden of their sin for Becket's murder laid so heavy upon the Plantagenets, that their acts of atonement required also a massive performance, that have crossed indeed countries and royal courts. Seeking to understand the ways in which the subject has been treated by medieval art, Lutan-Hassner chiefly examines the subject of atonement that brings together two main subject matters: the complexity of the Plantagenets' political status, which was aggravated as a consequence of their involvement in the murder of Thomas Becket, and their atonement, as a means of salvation and political survival. CONTENTS: Preface, I. Introduction. The Plantagenet dynasty and its artistic awareness. II. 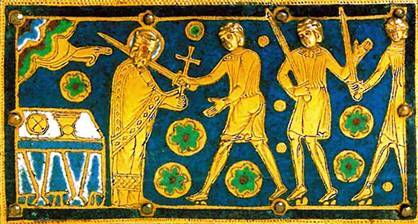 Thomas Becket and Henry. II. Visualizing good and evil. III. The cult of Thomas Becket and the Plantagenet second generation. Continuity or revolutionary approach (Henry the Young King. Richard the Lionheart. John and Henry III). IV. Atonement through the Arts (Henry II and his sons. Henry II’s daughters. Matilda and Henry the Lion - Germany. Leonor and King Alfonso VIII - Spain. Joan and William II - Sicily). V. Reliquaries and atonement (The enamelled chasses of Thomas Becket). Conclusion. General Index. Bibliography. List of Illustrations. Illustrations 1-252. Bound, 24x17 cm. 344 pp. (208 pp. text and 252 illustrations, mostly in colour) 2015 ISBN: 978-94-90387-09-9. Price: EUR 250. Enamelled reliquary chasse of Thomas Becket, Museé des Beaux-Arts, Lyon, 1200-1210 A.D.